The review is written by our best LinkedIn profile writers and primarily based on LinkedIn’s All Star level of completion. A complete profile helps you be found by your future employers or clients. Your profile picture and headline are two of the most important and most viewed elements of your profile. Consider editing your headline to give a better understanding of what you are seeking. 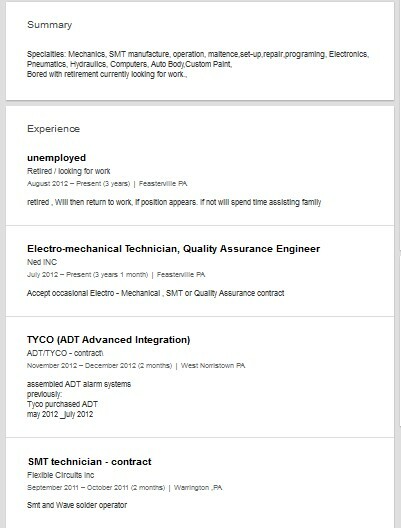 Instead of ‘unemployed at Retired / looking for work’, you could update your headline to say ‘Experienced Electro-Mechanical Technician Seeking Position’. Use your summary section to give an overview of your career, as well the types of positions you are seeking. Consider attaching your resume here as well. This will allow recruiters and future employers to get a full understanding of your background. To help polish your professional image, consider removing the information about being ‘bored with retirement’ in your summary and ‘if position appears. If not will spend time assisting family’. Your profile should let employers know that you are actively seeking employment instead of passively. Your headline and summary both indicate that you are retired yet retirement is not reflected in your profile. Consider updating your experience to show what position you are retired. Review your profile for spelling and formatting errors. In your summary section, you have the word ‘ maitence’ that should be ‘maintenance’. You might be also interested in our certified project manager Linkedin profile review. The electro mechanical technician is responsible for handling custom computers, hydraulics, pneumatics, electronics, programming, setup repair, operation, SMT manufacture, and mechanics. Have you ever read about the importance of the profile photo on LinkedIn profile? This is how you can be able to create a good impression in front of employers. Never think of keeping a limit of connections. The more connection you’ll have, the brighter chances will be to get ideal jobs. The headline of the profile can help you to introduce yourself in front of eth employers. 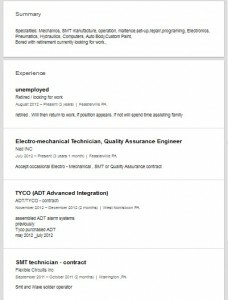 For example, ‘Experienced Individual Looking for Mechanical Technician Post’. It is important to discuss the Work Experience section in detail. This is the most important section that grabs eyeballs of employers before anything else. Share all the reasons that can force employers for hiring you. It is also suggested to include details of certifications you’ve got so far. It is highly impactful to impress the employers. Like a resume, you need to add the dates and years of working in different companies. The spelling and formatting errors can badly affect the overall image of your profile. Make sure that you add all the major keywords that can help employers to find you on the internet. Follow the profiles of professional mechanical technicians. You simply need to create the profiles in that manner. 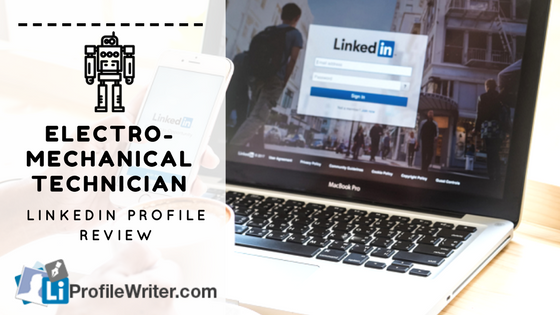 Your electro-mechanical technician LinkedIn profile review will be perfectly done by the real experts we have here for your help! Many expert mechanical technicians are on LinkedIn. Their profiles are highly valuable. The summary of your profile should be based on at least four to five paragraphs. Skills are the key secrets that can help you to attract more employers. If you’re serious about landing job in the respective field, it is advised to write a detailed summary based on factual information. Never take the profile photo for granted. Always set a personal picture on profile. For landing the desired job, you need to make more connections. The review and modification of LinkedIn profile are highly important, especially for all the job seekers. But you must know that thorough review of the profile is as important as creating it. The ideal formatting of text is possible once you start reading it out loud. Most importantly, the way to write text must be rectified in a proper way. Make corrections in all the headings and write the text in your own words. You can also use online text paraphrase to show that written text is professional. It is best to keep your data up-to-date from start to the end. Write all the major headings and important info in a proper sequence. All of these steps are important to create a quintessential profile of LinkedIn. Never try to make the profile hurriedly. Ask any expert about creating the best profile to appeal more employers. This is important for everyone. For more LinkedIn profile tips, feel free to contact our team right away! Still Hesitant whether You Need Our Help? Let Us Check Your Profile! We are not affiliated with the LinkedIn Corporation and provide independent services. LinkedIn, the LinkedIn logo, the IN logo and InMail are registered trademarks or trademarks of LinkedIn Corporation.